Peer-tutoring schemes frequently appeal to educators in Higher Education and there is much literature examining implementation and assessment. Using narrative research methods, this inquiry set out to understand the lesser-considered student experience, in particular, that of media production students acting as peer tutors on an accredited programme. Results give a picture of the complex, multi-faceted interpersonal relationship that comes into play in peer-tutoring and the problems faced by those in the role. This study stresses the importance of training and support throughout a peer-mentoring scheme as a way to improve such schemes. The increasing popularity of peer-tutoring in Higher Education has produced much comment on theoretical approaches, implementation and assessment; (Boud, 2001; Falchikov, 2001; Klasen and Clutterback, 2002; Parsloe, 2001). There is much less literature on the nature of peer-tutoring relationships and classroom interactions (Colvin, 2007). Last summer I conducted a narrative inquiry to better understand the student experience of my own peer-tutoring scheme, (see end for details) and to look for ways to improve it. Media Production students were asked to write a story (fiction or factual) to be based on an event that particularly stuck in their minds following their experience on an accredited Level 3 Peer Tutoring programme. 11 stories (written by six female / five male students) were submitted and these were analysed using coding and interpretative methodology (Carter, 2005; Butler-Kisber, 2010). It was surprising to find that some authors used the exercise to ‘confess’ to mistakes that had been made, usually by them. Overall, a great sense of honesty, and even scrutiny of their failings, came through the narratives. These stories gave me a much deeper understanding of students’ experience than the self-evaluative questionnaires they also completed. Many of the students’ stories talked about the ideal characteristics required to be a good mentor where student mentors are presented as always knowing the right answers and the right way to behave. These revealed a detailed picture of their motivation and ambition. Here the mentor is represented as a perfect example – calm, supportive and caring. The mentor does nothing wrong, she is confident and able. These ‘perfect mentors’ have time and patience to work one-to-one until the mentee has mastered the skill being taught. The teaching environment is assiduous and polite. Constructive feedback is insinuated and the session is concluded positively. Both mentee and mentor feel pride and achievement in their efforts. Here a ‘perfect’ mentor is dealing with an unexpected problem and she attempts to give the right advice and various solutions to enable the mentee to overcome her lack of confidence and fear of failure. Whilst here the story reveals how a ‘perfect mentor’ needs to prepare for the mentoring sessions and have a good, positive attitude. These narratives are really useful; they produce a clear picture of the aims, ambitions and high expectations held by student mentors. They also demonstrate their understanding of the commitment and effort required to do well in this role. Nearly half the stories explored or tested the boundary of the student - mentee relationship and its perceived or real jurisdiction. When to intervene? When to be a friend? Is it ok to lie? These honest, confessional accounts highlight the necessity of supporting students throughout a mentoring programme. The authors’ confessions here may be striking for their stark honesty but they reveal the vulnerability felt by mentors under pressure. Implementors of mentoring schemes need to be aware of the importance of addressing personal values / ethics / judgments at the training stage. Students will need good guidelines, even a code of conduct, to furnish them with a clear understanding of the mentoring role and the issues they may face. The point of interest here is how both authors use a writing style that dissociates themselves from the ‘bad behaviour’. In Story 1, by writing a detailed and descriptive list of “errors” made by a mentee, the author is effectively absolving himself from any wrongdoing – none of this scenario is his fault and he feels no compulsion to change the mentee’s behaviour. Whilst in Story 9, the author writes subjectively using a much more sparse but intense writing style. The description is extreme; there is little sense of perspective. Again the author is adamant the fault lies with the mentees. In both cases the authors offer no reflection or solution and feel powerless to change the scenario. Rather than viewing the non-attendance of mentees as a ‘total failure’, (Story 9) this author looks at how to make the best of a bad situation. This rather sweet report belies a much sharper subtext – that it is the mentor’s general attitude that affects the overall experience; a sunny and optimistic approach provides a good coping strategy. The negative stories reveal the need to address feelings of inadequacy and lack of confidence in the mentor training. Just under half of the stories examined the peer-tutoring role with a particular look at the feeling of ‘power’ it bestows on the student as a teacher. This sense of superiority, even dominance, reveals the need for mentors to discuss the role during the training phase. Here the author uses Star Wars analogy to express his belief in his mentoring ability. He sees himself as a master of the universe in an all powerful, all knowing, role. No faults or mistakes are identified. This is a parallel universe where mentors are great and mentees are compliant but able. This suggests a hierarchical, commanding approach where success is measured as a cloning of the teacher. These useful and informative descriptions reveal the recurring theme of power-play and give much greater clarity and understanding of the mentoring experience; in particular of how it feels for students to be put into a position of authority over other students for the first time. Training and supporting mentors in the role is, arguably, the best way to ensure that power is used positively (as a motivational or developmental tool) rather than as a means of ‘controlling’ mentee groups. Whilst the stories above may give rise to concern, the following stories show that there is good reason to be sure mentoring programmes are a worthwhile learning experience for students. Self-evaluation questionnaires taken before and after the module reveal that mentoring is often a transformative and successful experience for student mentors (a view supported in the literature, for example, Falchikov, 2006). This view is supported by six positive narratives that revealed a sense of the mentor’s progress (transformation and development) and success. Here the authors give some good detail about their experience and approach and the language used indicates transformation and progression. The compelling prose the authors have used here conveys the sense of progression and personal development they have gained as mentors and the sense of achievement they gain. The theme of ‘empowerment’ featured in over half of the stories. Following on from the idea of personal development, but rather different in nuance, is the sense of how the mentors view the responsibility of their role and how they wish to empower and enable the mentees. For students to grasp and disseminate this mutual concern in a relatively short time (just five mentoring sessions) is a pleasing outcome of the programme. This figure of speech, ‘fly students fly’, is arguably a key piece of data from the narrative inquiry. It encapsulates, I feel, how mentoring can benefit all students. It neatly suggests the best of the reciprocal relationship that can be gained from a peer-tutoring programme – that is, mentors and mentees experiencing collaborative learning that is beneficial to them both. I would suggest that this phrase is a good example of the ambition and sense of enablement that student mentoring can stimulate. I wanted to get behind the data supplied by evaluation questionnaires and, by using narrative inquiry methods, I feel I have achieved this. The stories students tell here give a much fuller picture of their experience as a mentor. They revealed, in particular, that students come to the experience with their own idealised view of how a good mentor should behave. This gives us a great foundation on which to build peer-tutoring schemes. However, we must be aware that students don’t always know how to manage the complex inter-personal roles involved in a peer-tutoring scenario. We cannot assume that they will always enhance a class and ‘do the right thing’. Peer-tutoring is certainly not a teaching substitution. However, if implemented well, an accredited programme can yield tangible and positive results of significant benefit to student tutors and tutees alike. Fly students fly. These stories have led me to understand the importance of underpinning a peer-tutoring programme with care and support. Care needs to be taken in the curriculum design to ensure that the training stage includes discussions on the mentor role; particularly addressing issues of ethics, boundaries, and power-play. This training should go beyond guidelines or a code of conduct and include role-playing of likely scenarios to give mentors viable coping strategies in the ‘classroom’. It is really important that staff, tutors and tutees are in agreement on the purpose of the role. Further, a robust, ongoing support system must also be an integrated into the curriculum (online or face-to-face) that gives students a place to discuss and find guidance (openly and non-punitively) on the challenges of position and influence they may face. Karen Arrand is an associate senior lecturer in Media Production. Karen came to academia after a long and varied career as a BBC Series Producer. Karen is mainly responsible for teaching contemporary broadcasting in television and radio up to postgraduate level as well as delivering professional development modules. Since completing an MA in Learning and Technology alongside her teaching commitments she is particularly interested in exploring the links between the development of new formats and learning in higher education. Boud, D. Cohen, R. and Sampson, J. (2001) Peer Learning in Higher Education: Learning from & with each Other, London, Kogan Page. Butler-Kisber, L. (2010) Qualitative Inquiry: Thematic, Narrative and Arts-Informed Perspectives, Los Angeles; London, SAGE. Carter, K. (1993) 'The Place of Story in the Study of Teaching and Teacher Education', Educational Researcher, 22 (1), pp.5-12. Colvin, J. W. (2007) 'Peer Tutoring and Social Dynamics in Higher Education'. Mentoring & Tutoring: Partnership in Learning, 15 (2), pp.165-181. Falchikov, N. (2001) Learning Together: Peer Tutoring in Higher Education, London; New York, RoutledgeFalmer. Klasen, N. and Clutterbuck, D. (2002) Implementing Mentoring Schemes: A Practical Guide to Successful Programs, Oxford; Boston, Butterworth-Heinemann. Parsloe, E. and Wray, M. J. (2001) Coaching and Mentoring: Practical Methods to Improve Learning, London, Kogan Page. A 20-credit module was designed based on reviews of peer-tutoring programmes in the literature that offer useful advice on how to train tutors. (Goodlad, 1998; Brandwein and Divittis, 1985; Falchikov, 2001). 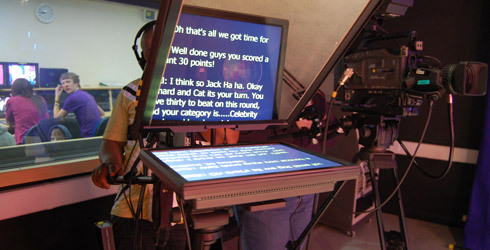 The course was only open to Level three Media Production students with TV studio knowledge. 13 enrolled – four males and nine females. I used Parsloe and Wray’s (2000) Coaching and Mentoring; practical methods to improve learning as the module text for its easy-to-follow structure and inclusion of key topics such as feedback, listening and asking questions. The module aims are to develop an understanding of teaching methods and delivery underpinned by current pedagogical principles. Students gain professional experience including project management, time management, enhanced communication and interpersonal skills and transferable skills such as team working, presentation, creativity and problem solving. Students were required to attend all training sessions and to gain a minimum of five hours tutoring practice. Each student was required to produce a self-reflective blog including postings on material presented in class and what they learnt from the practical sessions. They were also encouraged to complete tasks on the module’s electronic blackboard (Moodle) and take part in discussion forums. Level three students worked as a team of four to teach up to 20 Level one students. Their role was mainly instructional - to teach how to use studio equipment, and supportive – passing on their experience of working in the TV studio.